In the mobile world, the battle of two tech giants, Samsung and Apple, has been going on for decades. Winning consumers, keeping fan loyalty, finding miniature innovations … both companies have fielded new heroes every year—Samsung with the Galaxy and Apple with the iPhone. While Samsung is renowned for selling volumes, Apple is notorious for abiding by niche quality. But in the world of demand and varying degrees of economic prowess, quality often slides and volumes make an impact. But that does not mean to say that Samsung has never touched quality. Its range has proven to be quite effective since the Samsung i7500 launched in 2009, two years after Steve Jobs announced the release of the first iPhone. Since then the war has continued. 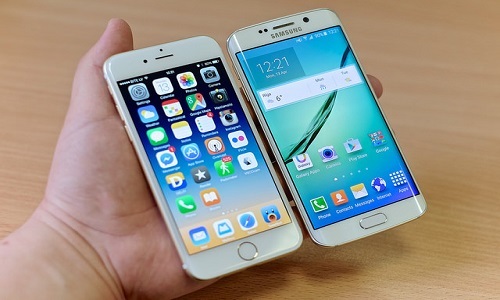 In 2015 we are witnessing the war between Galaxy S6 and iPhone 6. Here are eight differences between them, for which each has a sizable population of die-hard fans around the world. There is no consensus yet as to which makes for a superior product, though. Galaxy S6: A gorgeous phone from the Samsung stable, it has a premium touch and is light, too. A noticeable feature is the flat aluminum edge and the Gorilla Glass back. The removable back has been replaced, so you cannot swap out the battery; instead you have to go for wireless charging. The bottom remains uninnovative with drilled holes for the speaker, a USB port, and the headphone jack. The S6 comes in Blue Topaz, White Pearl, Gold Platinum, and Black Sapphire. The phone is a little bigger because of the larger screen and thinner at 7 mm. The phone weighs 138 g. The camera protrudes. iPhone 6: Its aluminum unibody design gives it better grip, flaunting Apple’s signature casings, and has rounder, smoother edges than previous versions. The iPhone 6 is available in three colors: Silver, Gold, or Space Grey, all of which are anodized aluminum and super stylish. The iPhone 6 versions are the thinnest to date at 6.8 mm. It is marginally lighter at 129 g. The camera protrudes. Galaxy S6: It has a significantly larger screen, and the display is slightly bigger at 5.1 in. It has a sharper display with an upgrade in its resolution and an incredible Quad HD (1440 x 2560) Super AMOLED panel with a staggering 577 ppi pixel density opting for OLED. This has resulted in perfect black levels and impressive contrast ratio for watching videos. But some feel that it exaggerates a lot on colors. iPhone 6: Apple uses LCD and delivers strong viewing angles and good color accuracy. It is large with its 4.7-inches screen size, and iPhone 6 Plus is even larger at 5.5 inches. When it comes to the resolution, the iPhone 6 offers a Full HD display at 750 x 1334 pixels, equating to 326 ppi. The iPhone’s screen is brighter. Galaxy S6: Samsung has opted against using the Snapdragon 810. It has instead gone for its own Exynos 64-bit octa-core chip, which has four cores running at 2.5 GHz and four at 2.1 GHz, with one geared toward efficiency and the other performance. The phone features 3 GB of RAM – that’s three times more than the iPhone 6. The S6 is the first phone to feature DDR4 memory, which is 80 percent faster than the iPhone 6.
iPhone 6: iPhone 6 features Apple’s A8 CPU, a 1.4 GHz dual-core, 64-bit chip with a swift GPU attached and backed by 1 GB of RAM. It comes equipped with the latest iOS 8 and M8 graphics processor and has a powerful battery that has been advertised to run for up to 14 hours! The storage options on iPhones are becoming massive with the iPhone 6 series offering up to 128 GB. Galaxy S6: It has a 16 MP camera and is equipped with smart optical image stabilization and an f1.9 wide-angle lens for low light. There is an IR sensor for automatic white balance adjustment. It offers up to 4 K resolution for video. Samsung has also upgraded its front camera to a 5 MP model with real-time HDR. iPhone 6: It offers 8 MP, and the quality is good. In video recording, the iPhone 6 doesn’t have optical image stabilization but offers 240 fps slo-mo and time-lapse and maxes out at Full HD 1080 p. Apple uses a 1.2 MP FaceTime HD camera at the front. iPhone 6: It also offers the latest wireless including 11ac Wi-Fi, GPS, and Bluetooth 4.0 and has a fingerprint scanner but no IR blaster. The iPhone 6 has NFC for its Apple Pay service. Galaxy S6: Samsung uses Google’s Android OS, and the Galaxy S6 is pre-loaded with version 5.0 Lollipop. Samsung overlays Android with its TouchWiz user interface. There are fewer pre-installed apps and some extra features. are simply for displaying app icons, but newer features such as the control center make things a little current. Galaxy S6: Samsung has a shot over Apple with virtual reality. The Samsung Gear VR headset pairs with the Galaxy S6 to create an impressive video-watching and game-playing experience. iPhone 6: If you have other Apple devices like an iPad and MacBook, you can very easily share photos, videos, and links between devices thanks to AirDrop in iOS 8 and Mac OS Yosemite. With a feature called Handoff, you can answer calls from your iPhone on a Mac. The iOS gets new apps first. Also, the Apple App Store has fewer spam apps than Google Play. Galaxy S6: It costs around $800 for 32 GB, $900 for 64 GB, and $1,000 for 128 GB. iPhone 6: The cost is $649, $749, and $849 for 16 GB, 64 GB, and 128 GB versions, respectively. Vyas Sivanand. "Differences Between Galaxy S6 and iPhone 6." DifferenceBetween.net. January 9, 2018 < http://www.differencebetween.net/object/gadgets-object/differences-between-galaxy-s6-and-iphone-6/ >. This is all what i need to choose an iPhone 6.